Cruise map showing the planned operations area for the expedition. The red line indicates the approximate trackline the ship will follow. Image courtesy of the NOAA Office of Ocean Exploration and Research. Download image (jpg, 115 KB). 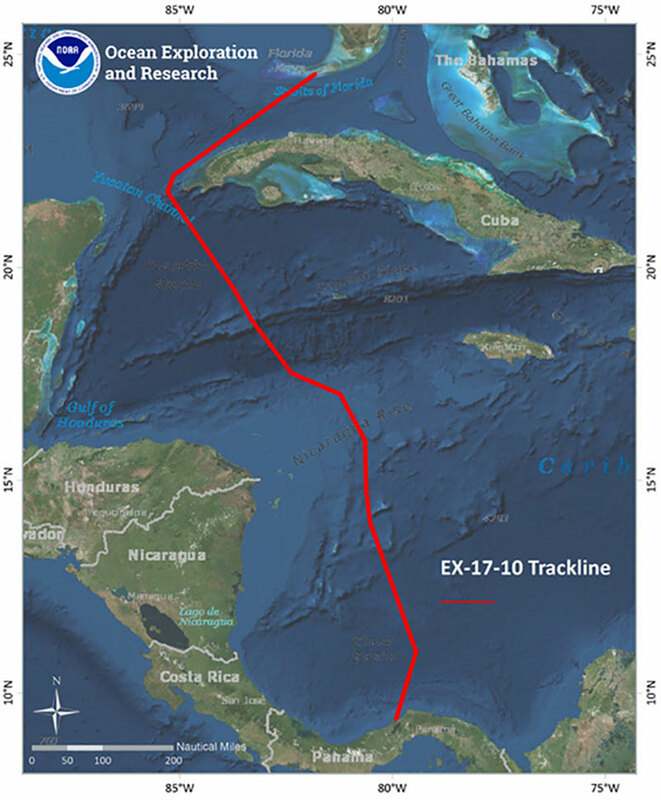 From November 15 - 22, 2017, NOAA Ship Okeanos Explorer will conduct an exploratory mapping expedition from Panama City, Panama, to Key West, Florida. Operations will include transiting through the Panama Canal followed by exploratory transit mapping through the Caribbean and the Gulf of Mexico. The 24-hour operations will include the use of the ship’s deepwater mapping systems and high-bandwidth satellite connection for hourly data transfer, real-time ship to shore communications, and real-time video streaming of sonar screens and ship's cameras. The transit route will maximize mapping of discrete geologic features including seamounts and ridges with little or no existing modern sonar data coverage. This mapping work results in high-resolution maps of the seafloor and provides acoustic backscatter data information about the seabed and water column. This cruise includes transits through the exclusive economic zones of Panama, Colombia, Nicaragua, Honduras, Cuba, and the United States. No data will be collected in foreign jurisdiction waters unless diplomatic clearances have been approved. Ko Barrett, Deputy Assistant Administrator for the NOAA Office of Oceanic and Atmospheric Research Programs and Administration, will be sailing on the expedition to get a first-hand experience of the Office of Ocean Exploration and Research (OER) ocean exploration work on “America’s Ship for Ocean Exploration.” Also on the cruise will be Susan Haynes, Education Program Manager for OER, developing enhanced educational materials to support OER’s mission. Two live telepresence-enabled interactions with shore-based audiences are also planned for the cruise: one with a classroom at the Universidad de los Andes in Bogotá, Colombia, and another with a science educator’s workshop coordinated by OER and hosted by the Dauphin Island Sea Lab in Dauphin Island, Alabama . Engaging and training the next generation of ocean explorers is an important mission objective of OER. Onboard this cruise will be two young scientists participating in NOAA OER’s Explorer-in-Training Program and supporting the collection and processing of mapping data. This program is open to enrolled undergraduate and graduate marine science students as well as those who have recently graduated from a higher education program. Two talented graduate students affiliated with NOAA’s Educational Partnership Program will also be members of the onboard mapping team. Joining the mission team on an OER expedition is a unique and highly competitive early-career opportunity, and the four individuals selected for this cruise will obtain exceptional hands-on experience in ocean exploration, at-sea research operations, and ocean mapping technology. During the cruise, you can receive updates about the progress of our exploration work, and view live video streams showing the multibeam sonar mapping work in action, by checking our website. All collected data on this expedition will be available in NOAA’s public data archives within 60-90 days of the conclusion of the cruise and can be accessed via the OER Digital Atlas.